In a nutshell: The 5th generation Moto G5 phone is a good value mid-range phone with smart looks, smooth performance, a decent camera, and reasonable battery life. It's not the most exciting phone you can buy, but it's a safe low-cost option. We described the 4th generation Moto G as a very safe mid-range option, and the 5th gen Moto G5 is even safer, and possibly even a little exciting. The look is a lot smarter than before, with a diamond-cut aluminium finish significantly raising the quality of the appearance. The size of the phone has been trimmed down, making it pocket-friendly, and although it's not particularly slim, its curves make it easy to handle. The screen is an ideal size for a mid-range phone at 5 inches. It's very sharp, with a 1920 x 1080 pixel resolution, although the contrast and colour saturation fall below the standard set by Samsung's AMOLED screens. The home button is a physical button below the screen, incorporating a fingerprint sensor, and there are neat, though rather small, buttons ranged along the right edge. The phone features a a water-repellent coating to provide some protection from splashes. The handset is available in a choice of Grey or Gold. The processor has been updated to the new Qualcomm Snapdragon 430 octa-core 1.4 GHz processor. This is nothing spectacular, but gives modest mid-range performance, with most apps opening quickly and running smoothly. The standard model comes with 2GB of RAM, but a 3GB version is also available, as is a dual-sim version. The built-in 16GB of flash memory is an adequate starting amount for storing data and apps, and you can add a microSD memory card if you have more to store. The phone runs a relatively clean version of Android 7 Nougat. Moto Actions offer quick gesture-based shortcuts to common functions, such as twisting your wrist to open the camera app. The main rear-facing camera is a decent mid-range offering that can capture good shots under a range of conditions. It incorporates a 13 megapixel sensor with auto-HDR mode, phase-detect autofocus, LED flash and 8x digital zoom. The f/2.0 aperture lets in a lot of light, for improved low-light performance, but shots in the dark will most likely be grainy or blurred. There are plenty of features to assist in getting the best shot, including one called simply Best Shot, and a burst mode that lets you grab pictures in quick succession. The rear camera can record video at 1080p resolution and 30 frames per second, with digital video stabilization. The front camera is a more basic fixed focus 5 megapixel camera, geared for selfies. The wide angle lens lets you take group selfies. 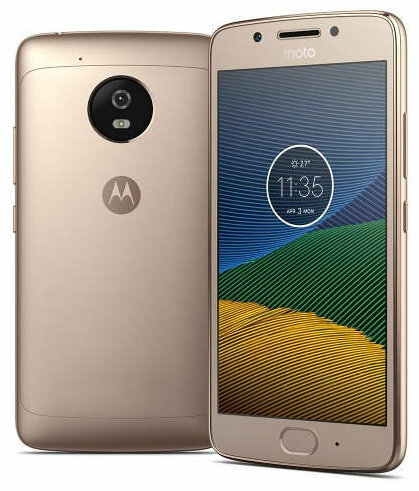 The Motorola G5 is a 4G phone, with dual-band Wi-Fi, assisted GPS & GLONASS positioning, Bluetooth and USB, plus a 3.5mm audio jack. A variety of sensors are included, such as a gyroscope and accelerometer. The battery size has been reduced compared with the Moto G4. That's understandable, since the screen of the G5 is slightly smaller, but we're never pleased to see smaller batteries in a phone. The 2,800mAh battery gives modest but unspectacular life. It will get you through a day of average use, but probably not two days. The Moto G5 is certainly the best-looking in the long-running Motorola G series, with a premium air about it. The 5 inch screen size is perhaps the perfect size too, and it's sharp and clear. Nothing much else has changed since the Moto G4, so you'll find a decent processor, camera and battery life here. The G5 ticks all the right boxes, and won't let you down. In a world where the price of flagship phones spirals endlessly upwards, it's good to know that you can still buy a decent all-rounder from a well-known brand for under £200. Alternatives to consider include the Samsung Galaxy A3 2016 and Huawei P8 Lite 2017. It's also worth looking at the uprated Moto G5 Plus. This replaced a Moto G4 Play that drowned off Ardrossan. Battery life maybe a touch worse but not dramatically so. Call quality just as good, browsing performance fine. All in all very good but not a great step up from the G4 play that was an outstanding device. In the last three years I have had an HTC One Max and an LG Google Nexus 5X and both went into an irrecoverable boot-loop due to hardware failure within 12 & 14 months of use. The Lenovo Motorola Moto G5 matches the Nexus 5 X and in some respects exceeds it.The phone is fantastic value for the price.It is totally customisable with Nougat Adroid 7.0 and matches the previous two phones I had in every respect and exceeds them in one .The battery is replaceable like the old days.I have found that "embedded" unreplaceable batteries begin to lose their ability to hold a charge after 12 months or so.They start to run hot which may well lead to component failure and the phone bricking.So a return to a replaceable battery is very welcome indeed as a means of extending the life of the mobile. The Lenovo Motorola Moto G5 is an excellent phone and you won't get better value for your hard-earned cash. Just to say that 18 months after getting this phone - Moto G5 -I have a spare battery to replace the battery the phone came though that battery has yet to fail. Also with a 64 Gb microSD card installed (maximum is 128Gb) there is a a means to move the majority of your apps to the SD card & off the internal 16 Gb memory. Currently with a total of 150 apps I still have 3/4 of the internal memory available. Hence the life of this phone is considerably prolonged. What a stunning phone for £170. I've always had flagship phones from Apple, Samsung and Sony i thought i would try a budget option and it doesn't disappoint. The size is perfect and screen is excellent and i love the near pure android experience. Web pages load on my mobile 4g as fast as my previous Sony z5.Honestly I'm over the moon with this phone and would highly recommend it. I've had the g5 for two weeks now, and it is a very good phone. The screen is clear and sharp, and the processor fast. Battery life is reasonable, but it charges from 0%-80% in an hour and a half, and to 100% in just over two hours. Sound quality is rather tinny, but you can always use headphones. It looks far more expensive than the �170 I paid for it, and would highly recommend it.